Found these beauties thanks to All Things Rosie. Eek! Your posts are doing absolutely nothing for my "no shopping" resolution. It's okay though, you'll take the blame right? Beef! These are so cool!! I want one! It's okay though, you'll take the blame right? As you say, SHUT DOWN!! These are insanely cute. OMG! Vanessa... Hey now! Just doin' what I can to help stimulate the economy! ;) Even if it is France's instead of ours. Ash... I wish postage from Europe wasn't a necessary consideration. Though, truthfully, Uncle still gotta save some pennies for the pillows to begin with! Laurel... So sweetly faithful you are! Thanks! wecouldgrowup2gether... Can't you just pick one up on the way home from Japan? ;) LOVE your posts! Paris Hotel Boutique... Shut down! Shut the front door! Get out! It all applies! 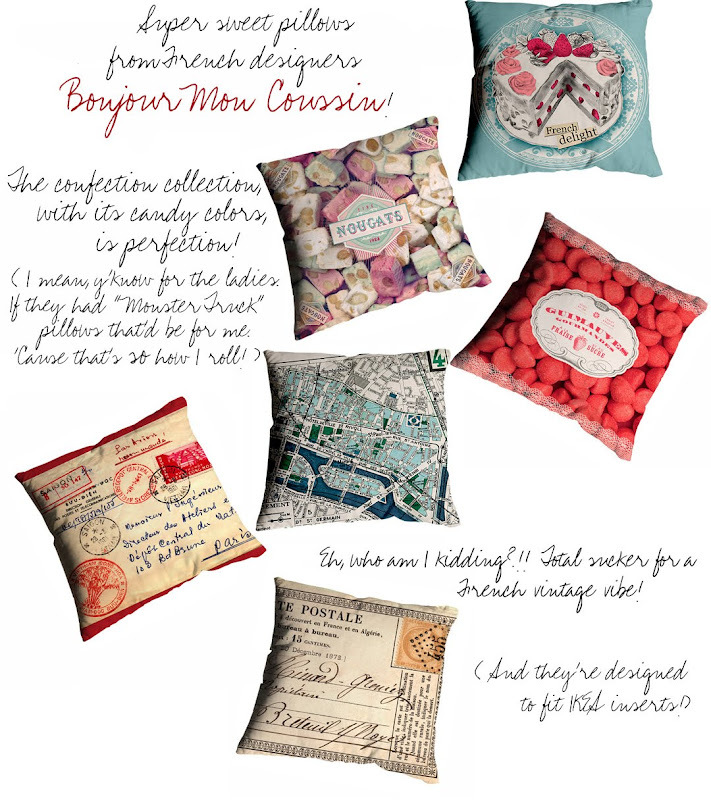 Okay, too much information, but I'm secretly longing for the "Nougat" pillow! I don't know what it is but it's hard to shake!